With Christmas quickly creeping up on us, Skittles is here to add it’s usual weird and colourful spin on holiday greetings. 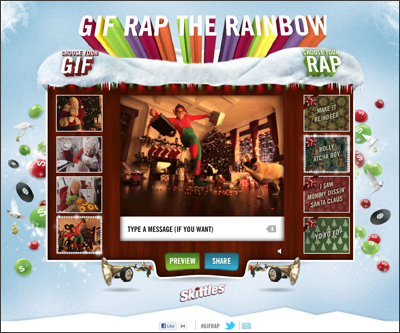 The Skittles ‘Gif Rap the Rainbow‘ website lets visitors create a holiday greeting for their family and friends by combining animated GIFs with a backing track. Back tracks with whimsically titles such as ‘Make it Reindeer’, ‘Holly Atcha Boy’, ‘I Saw Mommy Dissin’ Santa Claus’, and ‘Yo Yo Yo’. 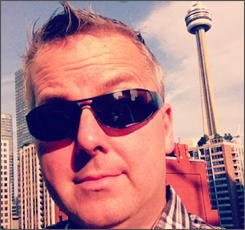 The Skittles campaign comes from the creative folks at BBDO Canada with design and development help from Scott Hiers, Pixelpusher, Fatbox, Apollo, Lunch and Family Style. Drivers and pedestrians were doing double-takes as they rounded this corner in downtown Toronto today. A very sleek-looking black Mercedes was parked in front of blurred background creating an illusion that the car was speeding down the street. The scene included a blurred mailbox, parking sign, fire hydrant and ad copy that read ‘Looks Fast Even In Park’. 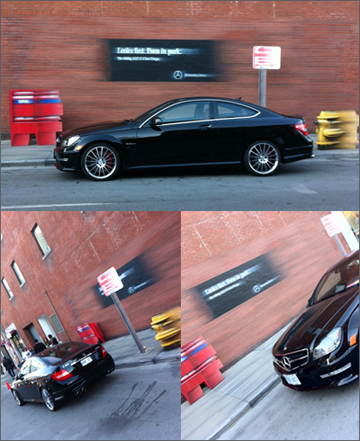 It’s all part of a clever promotion put together by Mercedes-Benz Canada to promote the new 2012 C-350 Coupe. The car will be back at this location on Peter Street just south of Queen Street West from 9am to 7pm Saturday. By the way, I know what I want for Christmas now.